South Pacific Pools & Spas is the largest retailer of Spas and Swim Spas in the Geelong Region and is a member of the "JUST SPAS" Group, selling ONLY quality Australian Made Spas and Swim Spas. All Spas and Swim Spas are manufactured by Spa Industries in Victoria. 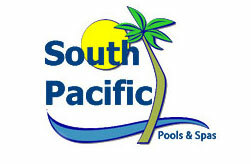 South Pacific Pools & Spas can offer regular servicing/maintenance of your pool and spa. Our fully trained Service Technicians can carry out all repairs on your pool and spa equipment. We also carry an extensive range of spare parts and accessories and have recently commenced a free delivery service for your spa and pool chemical needs. South Pacific Pools and Spas Geelong provide install, repairs and maintenance to the complete range of Cyclone, Designer and Signature Spas.